Drawing on the rich traditions of her country and her family, as well as her years of experience in the kitchen of her world-famous restaurant in Switzerland, Heymann-Sukphan presents the best and most appealing examples of Thai cooking. 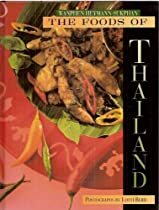 More than 80 recipes celebrate the delicate and unique freshness of genuine Thai cooking: refreshing salads, spicy and velvety soups, fiery curries, and a cornucopia of ideas for meals with fish, meats, and seafood. 50+ color photos.